Coach Wright prepares his team for another victory. 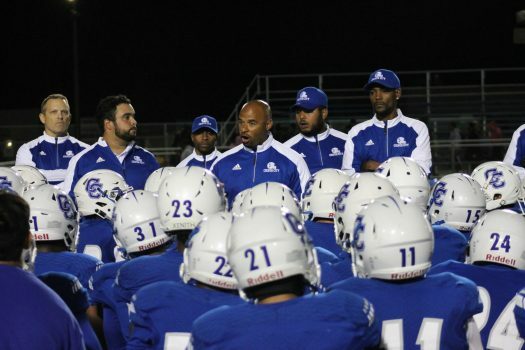 Winning has become a habit for this year’s Culver City varsity football team, as a 59-0 win over University High last Friday put them at a perfect 4-0 record. Coming off 2 straight Ocean League championships, CCHS is looking to capture its 23rd league title, and possibly the program’s first CIF title since 1978. Offensively, Culver City High has been nothing short of spectacular, all season, particularly this past week. Senior quarterback Jonathan Martin picked apart Uni’s defense with ease, throwing for 6 Touchdowns, while completing 70% of his passes. On the defensive side of the ball, CCHS was just as dominant. Culver held the opposition scoreless and racked up a team total of 13 tackles for loss. Next up for the Centaurs is an away game at Dorsey High. The Centaurs should look to avenge last year’s defeat at the hands of Dorsey, as Ocean League play soon approaches. Content and multimedia content © 2019 The Centaurian. All rights reserved.